This lushly animated film follows the romantic complications of two musicians as their troubles unfold against the rain-slicked streets of San Francisco. Inspired by a chance meeting in a hotel lobby that stirred up one of Perry’s favorite lines from Hemingway’s classic “A Moveable Feast” — “She was very pretty with a face fresh as a newly minted coin if they minted coins in smooth flesh with rain-freshened skin, and her hair black as a crow’s wing and cut sharply and diagonally across her cheek” — the film captures the spirit of San Francisco as seen through Perry’s eyes that day: wet, ephemeral and very much alive. Famed UK music journalist Alex Faulkner has compared Jour Majesty’s music to the “rootsy Americana” of The Band as well as more modern artists, such as Ryan Adams. The organic result of Perry’s successful commercial career in film, animation and audio engineering, combined with his band Jour Majesty’s many recent successes, “Empty Box of Wine” sparks a captivating conversation about the fleeting infatuations that compose the days, months and years of our lives. 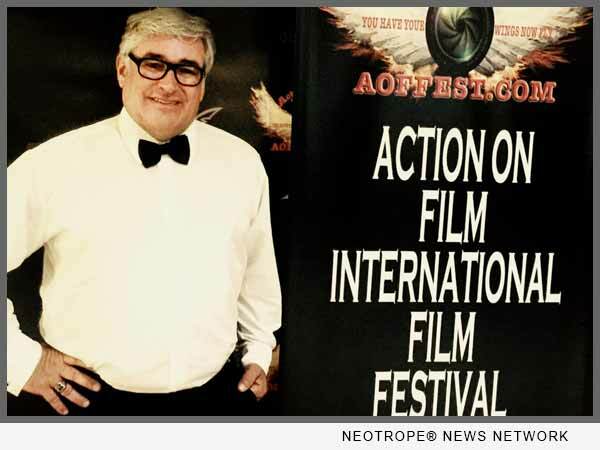 The Action on Film International Film Festival ran September 2 through the 9th; screenings were held at the Krikorian Monrovia Cinema 12 & LFX. The black tie awards dinner was held on Saturday, September 10 at the Westin Hotel Pasadena. More information is available online at http://www.emptyboxofwine.com and http://www.aoffest.com. Michael C. Perry is a Los Angeles-based filmmaker and musician; currently he is the lead singer of chart- topping indie folk band Jour Majesty. A graduate of the USC School of Cinema, Perry has enjoyed a successful career in both commercial film and audio engineering. Effective, affordable press release writing, targeted newswire dissemination in Calif. and/or nationally, and online marketing. A service of NEOTROPE® Founded 1983. Member BBB.